When you mix large crowds and alcohol, you’re almost always going to find some individuals who are not pleasant and copasetic. 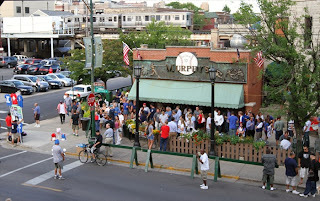 As Murphy’s filled with people, we noticed one guy with an obnoxious attitude who was also so stewed he could barely stand, and this was hours before the first pitch. Jamie suggested it might be interesting to follow the guy at a distance, watch him stumble around and bother people until he eventually offended the wrong guy. As entertaining as that idea may have been, the probability of a disappointing one punch knockout was great. Besides we had much better things to do. There was a Cubs game and we had seats in the batter’s eye suite. 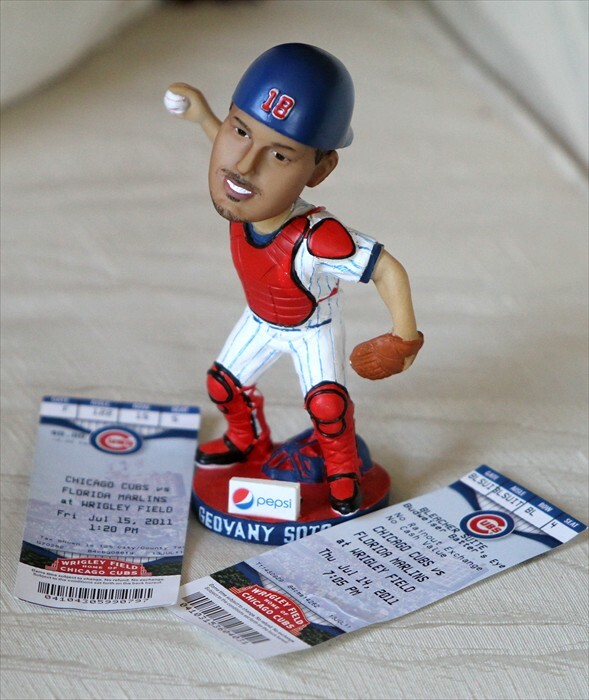 I was handed a box upon entering the gate, a Geovany Soto bobblehead – very cool. 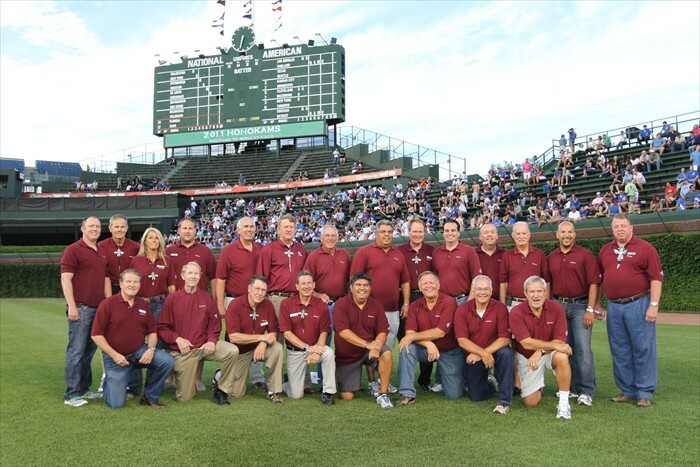 The atmosphere of the batter’s eye suite is different than any other seat at Wrigley. You have the comfort of a bar and grill with flat screen TV’s and private restrooms but, since there is no outside seating, you feel a bit isolated from the game. Prior to the start of the game the Hohokams had their photo taken on the field and Jamie and I went along. Being on the field at Wrigley is amazing. In high school I played center field and had dreams of some day doing it in the major leagues. Reality squashed that dream, but it didn’t diminish the powerful rush I got standing in right field with the ivy behind me, looking toward home plate and imagining what might have been. I snapped out of my daydream in time to shoot a few photos of the Ho’s (the Hohokams), and then after Jamie and I had one taken together, it was back to the suite. As mentioned in my blog on July 12, I hoped to talk with the Ricketts while in the suite about Boys of Spring – The Movie and our Kickstarter campaign to help complete the film. Laura Ricketts stopped out to say hello to our group and I was able to talk with her about the film. She wished me luck and mentioned that she was familiar with Kickstarter. I also talked with Cubs Director of Baseball Operations Scott Nelson who said he really enjoyed the Vince Lloyd “Voice of Summer” DVD. Talk about longevity, Scott has been with the Cubs since 1983 and in his current position since 1998. FYI, we are giving away the Vince Lloyd DVD as a gift along with the Boys of Spring – The Movie DVD package at the $25 level of Kickstarter. That’s the full 90 minute Boys of Spring film, plus the extras disc with extended Cubs interviews and goodies, the collector’s card, and the Vince Lloyd DVD all for a $25 pledge. Weird things seem to happen every time I’m in the batter’s eye suite. The last time I was there former Cubs outfielder Milton Bradley decided to toss a fan the ball at the end of an inning. Problem was there were only 2 outs and men on base. Thursday evening we had a great game going, very well pitched by Matt Garza with the Cubs holding a 2-0 lead into the ninth. With only 3 outs to go, Cubs closer Carlos Marmol comes in to shut the door on the Marlins. Marmol becomes the wild Marmol with 4 walks and the fish put up 6 on the Cubs in the ninth – Cubs lose 6-3. We decided the best course of action was to avoid the crowded train and commiserate with fellow Cubs fans in Wrigleyville, and commiserate we did. Jim had Old Style. A side note, on his bobblehead night, Geo went 4-4. Perhaps the Cubs can give away the whole starting line-up of bobbleheads every night. Not that I’m superstitious or anything. Friday – The Cubs had a 1:20PM start for Friday’s game, and the Hohokam’s were meeting at Bernie’s Tavern across from Wrigley at 10:45AM for some pre-game food and drink. 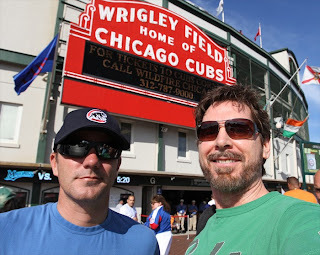 After some fun at Bernie’s, we made our way across the street and entered Wrigley. The tickets we had were from the Cubs to the Hohokams as a thank you for all the great volunteer work they do at spring training. Another beautiful summer day in Chicago and our seats are between home plate and first base just under the deck to provide shade. They couldn’t have been better. One of the Hohokams definitely had plenty of fun on the trip, so much so that during the game he nodded off. When this happens you can be sure of one thing, the person who nods off will soon awaken to an extremely localized hail storm of peanuts. Weekend at Bernie’s indeed. The game was outstanding as Ryan Dempster pitched great, reeling in 9 Marlins on K’s and going 8 strong innings allowing only 4 hits. With only 3 outs to go for the win and the Cubs holding the exact 2-0 lead as the night before it was as Yogi Berra said “déjà vu, all over again”. The Marlins did plate one run but Sean Marshall closed it out with a K giving the Cubs a W.
As the crowd sang Go Cubs Go, we noticed Cubs Chairman Tom Ricketts moving through the stands shaking hands and getting his photo taken with Cubs fans. As Jamie and I enjoyed the afterglow of a Cubs victory we looked up and Tom was at the end of our row. We ended up talking to him for a bit about the Hohokams and what a great time we had on our trip. A Cubs victory followed by a chat with one of the team owners — what a fantastic day at Wrigley!